Creating a home color scheme is so much more than just choosing a paint color – and it is so much more fun! 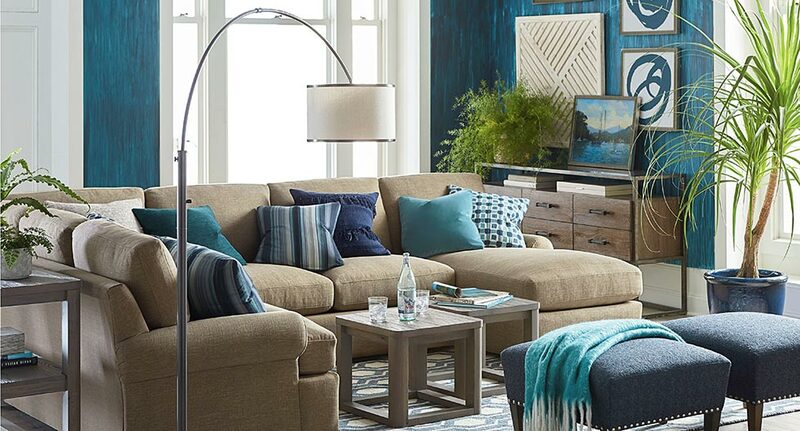 Whether you let your living room color ideas evolve as you go, or whether you try to plan your whole house color palette at once, each room has a color scheme. And just like a painter has the freedom to create a color palette that expresses what they want to show, so do you, in your own living room. A color palette for home design has the power to set the mood for a room, as well as evoke emotions. It can make a room feel warmer or cooler, larger or smaller. Depending on the colors you choose for furniture, walls, window coverings, and accents, you can create balance, harmony, unity, or emphasis. How Do I Create a Home Color Palette? Ready to start choosing paint color? With a few basics of color theory, your palette will emerge in no time. 1. What Colors Appeal to You? What colors are you usually wearing when you receive compliments on your appearance? Do you want the room to be a place of rest and relaxation? Or will it be used more for entertainment and social interaction? Do you need to try to make the room look bigger, more open? Or do you need to make the room look smaller and cozier? Use these questions as a starting point to put together the most meaningful living room color ideas for you. Remember the color wheel from art class? When you choose color combinations, think about how they relate to each other on the color wheel. You can use these relationships to create the “energy” you want in the room. Generally, the farther apart the colors are on the wheel, the more contrast and energy they create. A monochromatic color scheme means the colors are all shades or tints of the same hue, like all grays or all blues. An analogous color scheme uses three colors or hues that are neighboring each other on the color wheel, like orange, red and yellow, or blue, green and yellow. The colors don’t need to be strictly adjacent to each other. A complementary color scheme means the colors are opposite each other on the wheel, with one warm color and one cool color. 3. What Type of Light Does the Room Get? Also consider the natural light in the room. North facing rooms are darkest, receiving diffuse light most of the day. This kind of light is cool and bluish, which means cool colors will look even cooler, and whites will tend to look grayish. Bolder colors show up better than muted colors. Warm colors, or lighter colors that reflect rather than absorb light, may be a way to brighten the room. East-facing rooms receive early morning light. This light appears warm yellow or gray before noon, and then turns bluer later in the day. Bright morning light tends to wash out colors. Blue greens and cool neutrals come to life in the morning light and retain their vibrancy as the day progresses. If the room is used in late afternoon, warm colors will help to balance out the lack of light. South facing rooms receive late morning and early afternoon light. Lots of high-in-the-sky light brings out the best in cool and warm colors. Dark colors will look brighter, lighter colors will glow. West-facing rooms receive strong late afternoon light, a golden warm light that can be intense. In the morning, west-facing rooms are shadowy. You can use light-reflective cool colors to balance the warmth, or go with a hint of warm red if the room is used in the morning. What Elements Should I Choose First? It’s easiest to create a color palette for home design if you start with a certain color and then work your room around that. Resist the temptation of choosing paint color first! Instead, find a more long-term investment that you love, like furniture, fabric, or tile. If you have patterned upholstery, colorful rug, or a large piece of artwork you love, pick colors from that, remembering to consider your wood finishes as well. It is much easier to find a paint that works with the fabric than the other way around. You can change accent wall colors in an afternoon with a small investment in a pail of paint. 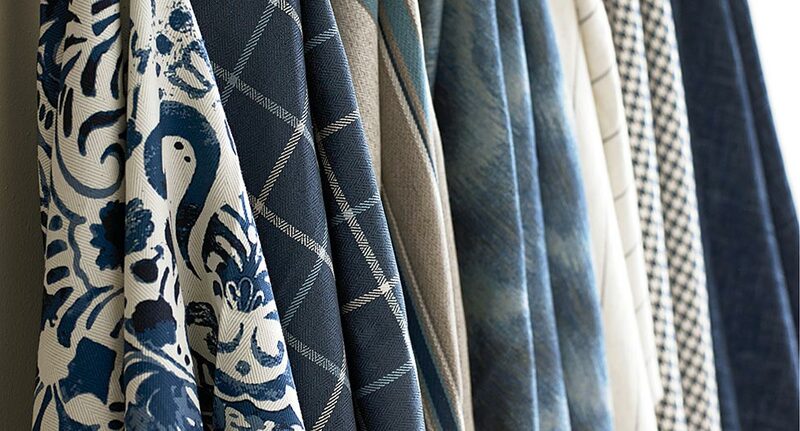 Accent fabrics that incorporate your home color palette are a great way to tie everything together in a way that looks intentional. You can create rhythm in a color scheme by repeating a color in various places throughout the room. 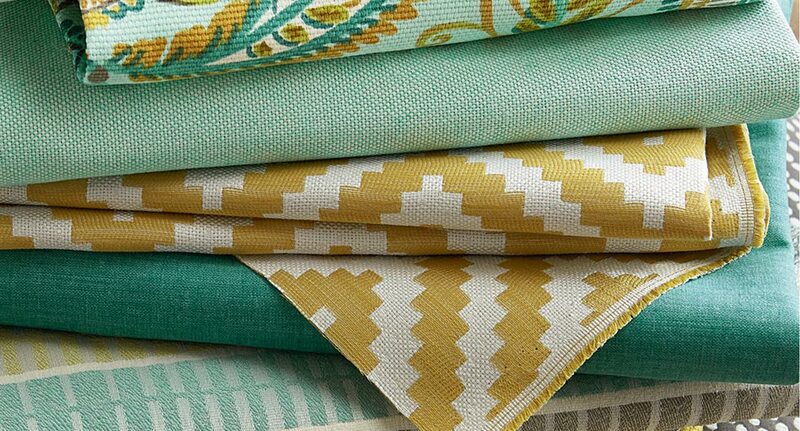 Choose fabrics that use same color family, but in varying pattern sizes like the below. Weight of fabric and smoothness also affect how color appears. Fabrics with smooth textures reflect more light, giving them a lighter visual weight. Fabrics with coarse or rough textures absorb light, rather than reflect it, and tend to make items look heavier. So how do you create a color palette for home design? There are no absolute rules, of course. 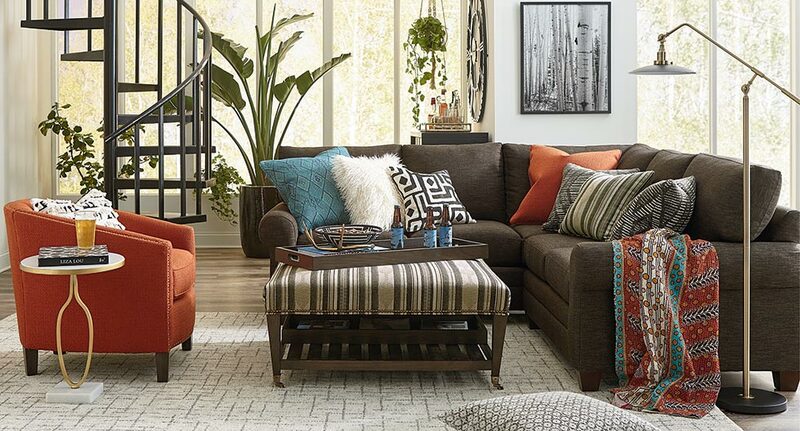 If there were, everyone’s living room color ideas would be exactly the same! It’s best to go with what appeals to you the most. See one of our design consultants for friendly suggestions for your home color palette, or to find elements that make your home come alive.